Over the past twenty-two years, we have developed a collaborative custom jewelry design process to produce a talismanic ring or expression of artisan jewelry just for you. This post will explain how we can work together, step by step. When you envision this piece of jewelry, what do you see? Is it a fully fleshed-out idea, or a vague image shimmering on the horizon? Take your time with it. Remember the intimate symbolism of jewelry. This is something you’re going to wear on your body, to remind you of who you are, and guide you toward your fullest potential. It’s living life to its fullest, a celebration of the gift of today. If you have a design in mind, and want to share a drawing or photo, that’s a great place to start. If it’s just a concept in your mind’s eye, fret not. That’s what we’re here for! Either way, you can get started by filling out the form on our Custom Design Page. Typically, we start with a two-dimensional design illustration. Depending on the job, it may be either a simple hand drawing or an Illustrator document giving precise dimensions. Once we’ve worked through the details, we'll forward it on for your review—and, if necessary, suggestions and revisions. 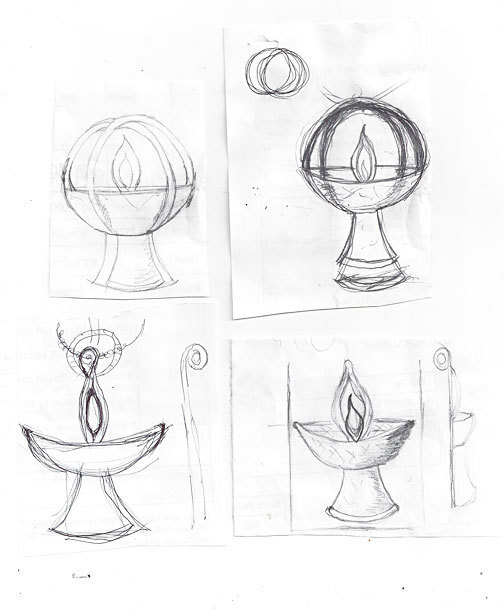 The initial sketch of a custom Chalice Pendant we created for our friend, a Unitarian Universalist (UU) minister. After you approve the schematics, we may need to translate the design to a 3-D rendering. We'll email this to you—and again, you’ll have a chance to review and modify, should you wish. 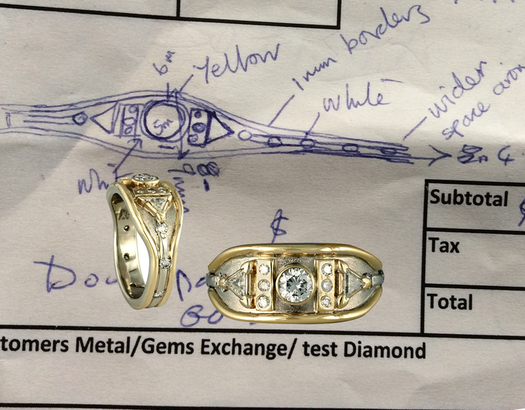 Once this step is complete, one of our master jewelers may go directly into making the design, by hand, in our studio. In other cases, we'll create wax models, and may in some instances send one to you. This is particularly true with intricate custom rings, where we want to be 100% sure that you like both the design and feel before we begin sculpting it in metal. We can still make adjustments at this time—and if necessary, create new wax models. 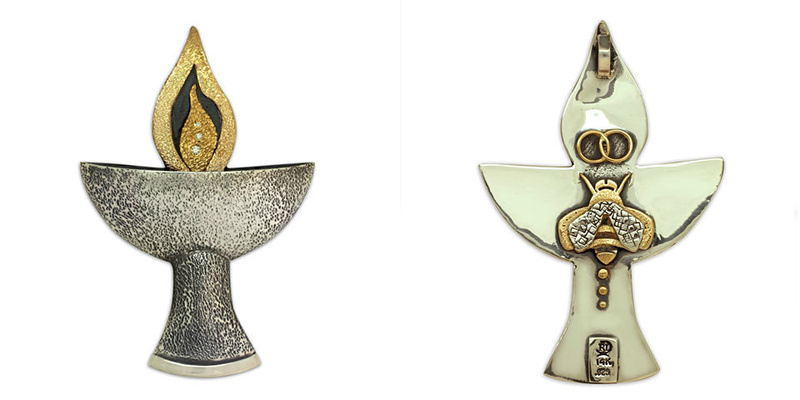 Here's the Chalice Pendant in its completed form. To the back we added a UU symbol, as well our signature Bee design. Made using Fair Trade Gold. Cost depends on a number of factors: materials used, the complexity of the design, and the back-and-forth of the design process itself. Timing is determined largely by the number of steps involved with the project and how quickly we can move through the processes. If this is for a wedding, it's best you give us plenty of time before the Big Day to get the rings exactly as you want them. This type of custom request adds little or no extra time to production. Upcharge, if any, is primarily determined by changes in material. 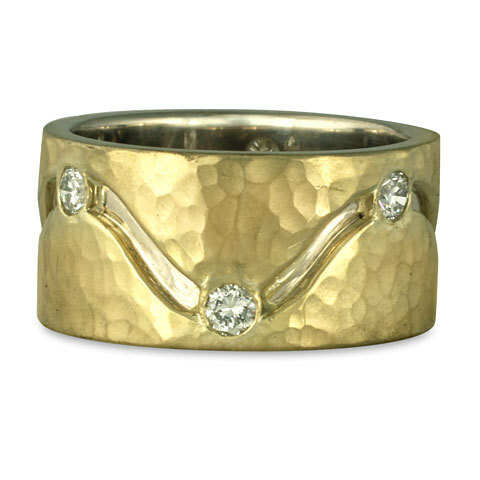 To create this custom wedding ring, we added a customer's own Diamonds to our Hammered River Ring design. With moderate custom processes, we are making changes to the original design of the piece. We can vary the width of a pendant or ring by changing its borders. We can make a particular pattern larger or smaller. We can make a piece heavier, or take one pattern that you like from a particular pendant and move it to another. We can also change clasps or ring mounts, add or subtract lengths from different chains, or make something extra-large or extra-small within our existing line. Sometimes these changes are relatively simple, but other times we will be creating drawings for collaboration. These types of custom changes can add time to the project. Depending upon whether or not we have to create drawings, we may require a small down payment—which will be applied to the cost of the piece. 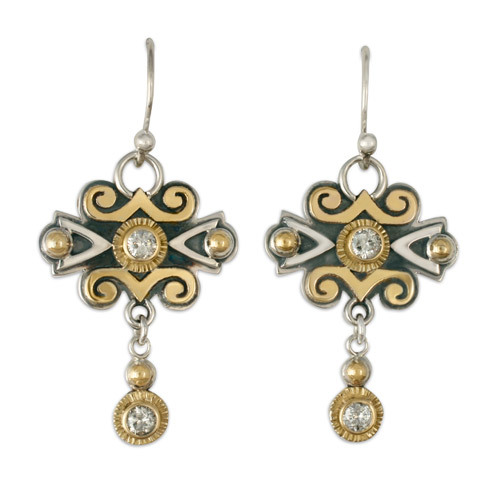 These custom earrings are a variation on our Cascade Earrings. In place of the garnets we typically use, we substitued a customer's own diamonds. We also created custom gold mounts for these stones. This process involves making something entirely original from your own idea. It starts simply with you sending us a drawing or a concept. We will discuss it with you, and talk about timing and options. Once we agree to move forward, we may require a non-refundable down payment. Once the design is approved, we will ask for a further deposit or full payment. 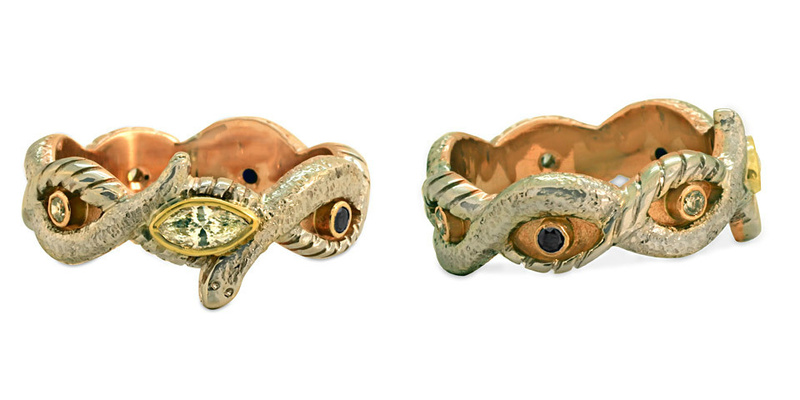 A custom Snake Ring we designed for a customer. For this project we used recycled diamonds, as well as ethically-sourced sapphires, which are traceable to a small-scale mine in Sri Lanka. 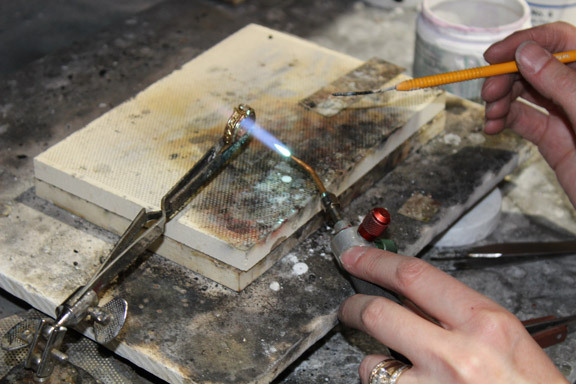 Our step-by-step custom design process outlined above guarantees you a piece of jewelry you’ll cherish for year to come. Once a custom design is approved for fabrication, it is non-refundable. Exchanges are sometimes possible, at our discretion. ***Psst...Looking for some Custom Jewelry Design Ideas? Check out our Pinterest board! Above: The making of a Custom Engagement Ring from Reflective Jewelry!